Despite the chemical sounding name, Creatine is actually a substance that we consume whenever we eat meat and fish. It's even made by our own bodies in the liver. Creatine is concentrated in muscle tissue including the heart, where it's involved in the production of ATP; the source of energy that powers muscle contraction. The use of Creatine as a sports supplement is supported by numerous studies that indicate it can contribute to training programmes that aim to build muscle size. 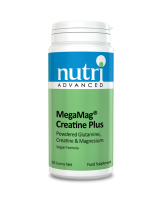 Other studies indicate that Creatine may help to delay muscle fatigue. 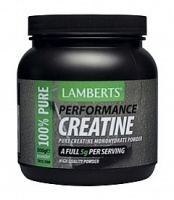 Lamberts Creatine Powder 500g Pure Creatine Monohydrate for mixing in to drinks & shakes. Aids energy production. Lamberts Creatine Tablets 1000mg Pure creatine monohydrate health supplement in the form of easy to swallow, convenient tablets. Helps build muscle during training.